The average sale price says it all: this auction came to a close on Sunday 18th of March with a phenomenal overall result. We have never seen such high average sale prices, except for the auction of the Janssen Brothers on PIPA (+20,000 euro/bird for 22 pigeons). An astounding 13,489 euro per bird was paid on average for 178 pigeons. This is unprecedented. The auction started on Monday 4th of March, and Armando's sale price was already at 300,000 euro after just a few minutes. It marked the start of an exciting two-week bidding race that involved many international names, from the USA, South Africa, Belgium, China and The Netherlands. But China was likely to place the winning bid, just like they did in so many other top of the bill auctions. Two Chinese fanciers were battling it out in the closing hour of the bidding contest for Armandor. 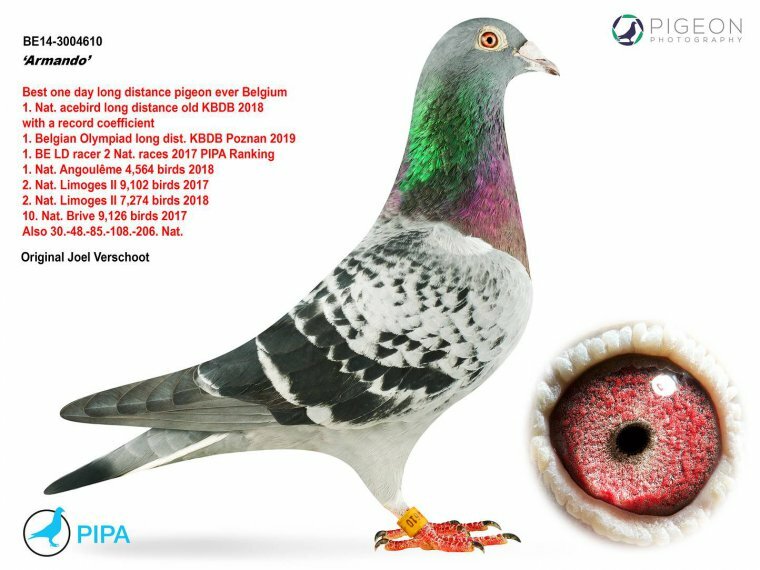 He was already worth 532,000 euro on Sunday morning, making him the most expensive pigeon in Belgium with a record bid. His eventual sale price went up to a whopping 1,252,000 euro in just about an hour. As a result, Belgium's best long distance bird of all times is now the most expensive bird ever to be sold in auction. The previous record belonged to New Bliksem of Gaby Vandenabeele, with a sale price of 376,000 euro. Armando will be worth almost 900,000 euro more. In addition, seven youngsters of Armando were put up for auction as well. These seven youngsters were sold for an impressive 150,900 euro, or an average of 21,500 euro per youngster. The seven youngsters are moving to China (2), Belgium (2), Turkey (1), Germany (1), and The Netherlands (1). The second star of this auction was Contador, another highly unique super class bird. He would be top of the bill in almost any other auction. He was sold to a Chinese fancier for exactly 200,000 euro. The third and fourth most expensive bird in auction were the super class pair Brauwer x Twistertje. Brauwer was sold for 83,000 euro, and Twistertje had a sale price of 43,000 euro. They are sold to one and the same fancier. We had a total of 178 pigeons in auction, and 79 of them were youngsters (2018+2019). The 79 youngsters were sold for 416,900 euro, or 5,277 euro per youngster on average. Despite the exceptionally high sale prices, we noticed that 47 pigeons were purchased by Belgian fanciers, which is quite remarkable. It turns out quite a few renowned Belgian lofts have invested in one or more pigeons of Joël Verschoot. The 178 pigeons were sold to 21 different countries: Belgium (47), Taiwan (47), China (46), Japan (8), USA (5), Thailand (3), Slovakia (2), Germany (2), the United Kingdom (2), The Netherlands (2), The Philippines (2), Portugal (2), Saudi Arabia (2), Canada (1), France (1), Italy (1), Kuwait (1), Morocco (1), Romania (1), Turkey (1), and Trinidad & Tobago (1).